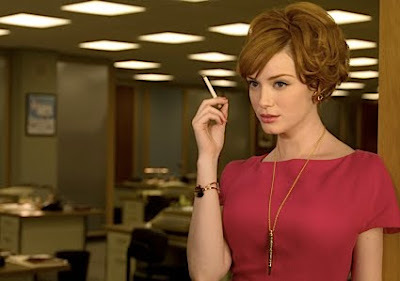 AMC's Mad Men is one of my favorite shows on television, and my favorite character is the original HBIC, Joan Holloway-Harris. When she saunters in the room with her pen necklace, you know she means business. Rumor has it, they are introducing a new character when the show returns in 2010..
Joan's long-lost sister, Kitty Holloway..! What mystery and intrigue will arise when this buxom beauty blows into town? Will she be an employee at the newly minted Sterling-Cooper-Draper-Pryce? Another notch on Don Draper's bedpost? I guess we will just have to tune in to find out!